When home computers seemed like rare gadgets, a killer app was a program so compelling that people purchased the computer just to run the application. VisiCalc became the Apple II’s killer app, and then Lotus 1-2-3 drove customers to the IBM PC. From Gauntlet to Diablo, the dungeon crawl is now such a popular video game convention that it stands as its own genre. Even folks who think tabletop games are all like Monopoly and see video games as unworthy of attention, know of Indiana Jones, the Tomb Raider movies, and the Mines of Moria. The D&D dungeon may seem conventional by now, but in the early 1970s, nothing exactly like it existed in the popular imagination. The dungeon has developed such a huge role in popular culture that we struggle to imagine how novel and compelling dungeon crawls were 40 years ago. In 1977, when I first overheard kids at my new school talking about Dungeons & Dragons, I managed to learn just two things about the game, but these hints electrified me. In D&D, you played a person in the game who grew in power through experience, and you explored dungeons filled with monsters, hidden secrets, and treasures—often magical. I went home, opened the yellow pages, and called countless hobby shops in Chicagoland, searching for one that stocked this astounding game. When I finally located a copy at the distant Hill’s Hobby, I coaxed my mom into providing a ride—but not until the weekend. Still excited, but facing a torturous wait, I sat down with some graph paper and speculated on how a game of dungeon exploration might play. My enthusiasm was not unique. 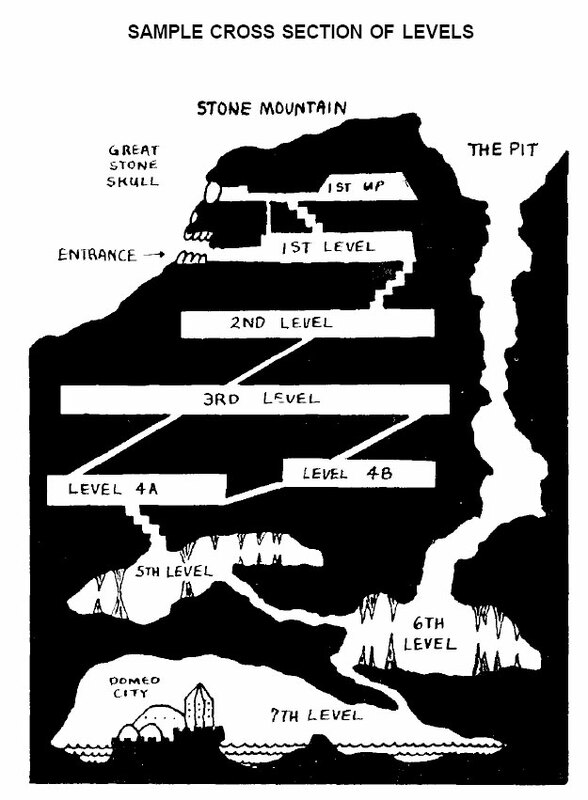 The dungeons under Castle Blackmoor began as a minor diversion to the campaign’s fantasy battles above ground, but the Blackmoor bunch spent so much time underground that Dave Arneson ultimately declared the above-ground conflicts lost to forfeit. Dave Megarry of the Blackmoor game wanted to capture the dungeon experience during Arneson’s down time, so he created the Dungeon! board game. Even when the first role-playing games left medieval fantasy, they kept dungeons or sites that played like dungeons. Metamorphosis Alpha (1976) moved the dungeon into space in the form of the drifting starship Warden. 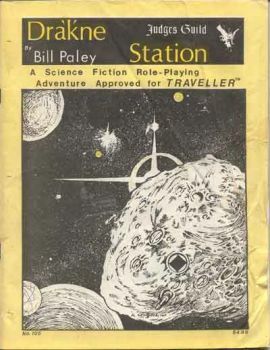 Traveller (1977) brought an entire universe to play in, but for years all the game’s published adventures featured derelict space ships, alien and abandoned research stations, and other location-based adventures resembling dungeons in space. Darthanon Queen (1980) consists of deck plans for a 600 ton merchant ship along with a crew and a passenger roster. The adventure suggests a few scenarios to stage on the ship, including one cribbed from Alien. Adventure 2: Research Station Gamma (1980) describes an arctic laboratory that players must infiltrate. Adventure 3: Twilight’s Peak (1980) takes characters to a location with “many of the elements of a haunted house,” and then to an alien base complex. Ease of play – The dungeon’s walls limited options, making the game master’s job manageable. In a Gamespy interview Arneson said, “Dungeon crawls were, I think, the easiest things to set up because all you had to do was draw a grid map and didn’t have to worry about the great outdoors and setting up trees and stuff. People also couldn’t go wandering off where you didn’t have a map because it was solid rock.” More than anything, the wide-open space of Traveller drove designers to attempt to duplicate the dungeon experience in space. Group play – Dungeon exploration provided an activity for a party with divergent skills. A host of role-playing games ranging from Chivalry & Sorcery to every spy game ever struggled to find reasons for characters to work together. Obstacles – Dungeons provided an excuse for monsters, tricks, and traps. Their inevitably-insane architects gave dungeon masters free reign to create a funhouse environment. Goals – The treasure underground gave a reason to explore, and a gave players a common goal. Flavor – Dungeons provided an evocative setting full of secrets and ripe for exploration. For me, the most evocative illustration in the blue box was the underground cross section. I wanted to crack the mysteries of just such an underground complex. This entry was posted in Role-playing game history and tagged Blackmoor, Dave Arneson, Dave Megarry, Dungeon board game, Dungeon crawls, Empire of the Petal Throne, Metamorphosis Alpha, Traveller. Bookmark the permalink. I love how with a true megadungeon campaign I can run it with whoever I want, with as many different groups as I want, and it is all just so amazingly easy and fun. The big trick is to end each session with PCs back in town so that the player/PC group can vary each session as a new expedition readies to set out.